Whether you want a shower screen to rev up the “wow” factor of your bathroom or need a wardrobe system to maximise your home’s storage, Pivotech offers the best selection for high performance, high style and real solutions. We offer wholesale supply of shower screens, wardrobe systems, frameless glass hardware and framed mirrors to aligned Pivotech installers. Contact us for your local Pivotech retailer. Stylish Pivotech showers can be manufactured to fit into any bathroom. Our high quality shower screens deliver years of effortless performance. Homes today require a fresh take on storage. 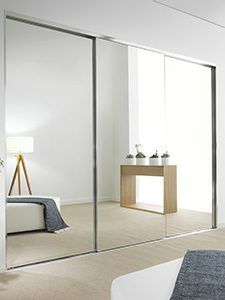 Pivotech wardrobes give you sleek designs proudly developed and manufactured in Australia from premium materials. Tested for durability and designed for luxury, Pivotech’s line of frameless glass hardware brings an bright, fresh feel to contemporary bath designs. 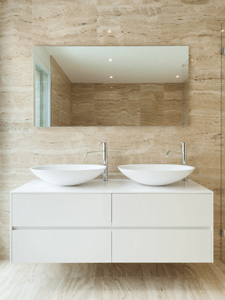 A Pivotech mirror frame helps highlight a beautiful bathroom, without detracting from your overall decor. Attention to detail makes a big difference. 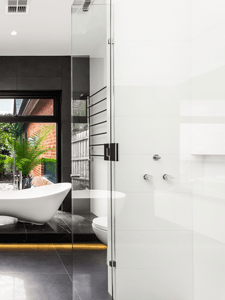 The bathroom is a practical space, but practical doesn’t have to mean boring. Turn your bathroom into a room you enjoy, one that reflects your lifestyle and design preferences with Pivotech. The natural privacy associated with the bathroom lends it to wonderful decorating opportunities with the possibility to be your own private sanctuary. With Pivotech’s expansive offering of shower screens, frameless glass hardware and home furnishing elements, you’re sure to find your perfect match. Insist on practical elegance. Insist on Pivotech. You’ll find Pivotech a favourite feature in Australian homes. Since 1989, interior designers and architects choose Pivotech shower enclosures and wardrobes for their practical, on-trend styles. Builders know the Pivotech name means reliability and straight forward installation. Discriminating homeowners love the easy-to-clean good looks and effortless performance of the Pivotech collections. A Pivotech shower screen can be trusted. 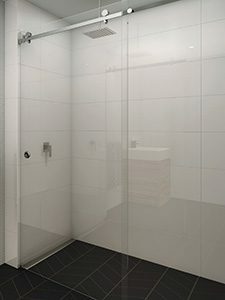 Pivotech design and manufacture Australia’s most innovative range of frameless, semi-framed and fully framed shower screens, as well as wardrobes and mirror frames. Our fashion-forward home furnishing products are available from and installed by our network of Pivotech Professionals located throughout Australia. Contact us for your local Pivotech representative. Our catalogue of home decor products continues to grow based on design trends, advances in hardware technology, and feedback from the industry.